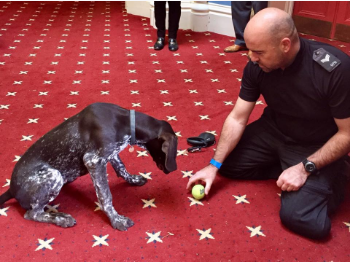 Ozzy, a German Short Haired Pointer, is training to be a Tri-Force police dog for Wiltshire, Gloucestershire and Avon & Somerset. He has decided to share his diary so you can see how he's getting along! So, if you have ever wondered what work is involved in training a police dog, now you can find out, straight from the horse's (or dog's) mouth! Wiltshire Police (thank you for the photos!) are sharing 'the diary' of Ozzy, one of the police dogs in training to work for them, Gloucestershire and Avon & Somerset Police. "Well I suppose I’d better start by introducing myself, I am a seven month old German Short Haired Pointer and my aim in life is to become a fully trained Police Dog, my name is Ozzy and my handlers name is PS Denis McCoy, but I call him Dad. He is one of the Police Dog Sergeants in Tri-Force. Dad brought me home when I was eight weeks old and introduced me to my brothers, a big Belgium Shepherd called Lebo, who is a fully trained General Patrol Dog and Paddy, a black Labrador Explosive detection dog. We all live together with my Dad in the South Somerset. On Monday the day begins at around 5.30am when I can see an upstairs light come on, I know in about 15 minute’s time Dad will be downstairs making my breakfast. When I first see him I always make a fuss of him because I know that’s what humans like, but really all I’m interested in is my food. I can hear the kitchen door handle turn so I begin to prepare myself, the tail starts to wag. As the door opens I greet him with my usual enthusiasm. With that over we are ready to make our way to work. On the way we stop in a big field so that I can stretch my legs and have a quick play with Lebo and Paddy. Dad usually gets the grooming brushes out now so by the time we reach the Police Station, I really look the part. Once here Dad puts me in the back of his police car, and we make our way to the training venue for the day. I love the journey down because it makes me feel like a real police dog, and sometimes Dad puts his blue lights and horns on just to please me and so I can get used to the noise. Once here, Dad takes me into a field and throws my favourite toy to any human who jumps up and down to get my attention and then runs out pretending to hide my toy. He puts my toy down in different locations and runs back towards us. This is a form of hide and seek Dad gives me a command to find my special toy then I have to sniff the air and find it as soon as I can. Dad calls it searching. I quickly find it and Dad tells me what a good boy I am before throwing it and playing games with me. I then go back to the van for a drink and a rest. From here I watch the other dogs do their training - it’s a shame they are not as good as me. Dad then takes me to a new building I’ve not been to before. We go inside and he takes me into areas with different floor surfaces, up staircases and meeting different people, it’s all fun. Dad even seems to enjoy playing with me as much as I do with him. Dad looks happy with me so far so it’s back to the van for a drink and wait for my next turn while the others have a go. It’s been a good day but I now get to see Lebo do his favourite exercise - Dad gives another man a sleeve which he puts on his right arm and he starts to shout at Lebo and Dad. Lebo’s not having that, I think to myself, how dare you shout at my Dad. Then Dad says Lebo can bite that sleeve as hard as he can. When Lebo bites, I can hear the man shout even louder and eventually lets Lebo win the sleeve before he scuttles off with his tail between his legs, that will teach him. I’m feeling really pleased with myself and Lebo for dealing with the nasty man and I can tell that Dad is as well because he keeps saying good boy and patting Lebo. By the time the others have a go it’s nearly time to make my way home, but not before another man takes my favourite toy and tries to hide it again under some bushes in the wood. Don’t these humans realise that with my nose I can smell human scent a mile off? I suppose I must keep humouring them so off I go running around smelling every bush and tree until I find them. I really want to be a Police dog and can’t wait to go back tomorrow. I hope I make it."